These are the largest concentration of petroglyphs in the western hemisphere displayed here in the canyons of the Coso Mountains, which are located in a remote region east of the Sierra Nevada Mountains and west of Death Valley, where the Great Basin and Mojave deserts come together. The 3-mile long Little Petroglyph Canyon contains over 6,000 images alone. 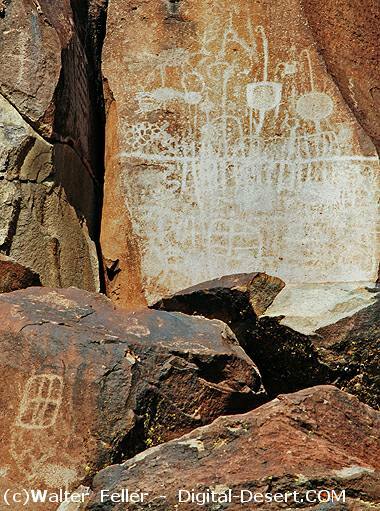 Coso rock art has become famous for its stylized representational symbolic system, a system that has intrigued—and baffled—archeologists and lay observers for decades. Recent research at this California desert District has begun to illuminate the long history of the people here and the meanings they inscribed in stone. It also underscores the value of America's endangered cultural resources.